Australia are beatable. That is the buzz-phrase you will be hearing quite a lot over the next few days as the Ashes touring theatre winds up in Perth. We heard it in the wake of the Brisbane Test and, after their deflating 120-run defeat in Adelaide, England coach Trevor Bayliss repeated it. Australia are beatable. The batting collapse on the third evening, the scare England gave them on the fourth, the encouraging start in Brisbane: it all adds up to one thing. Australia are beatable; pass it on. “We’ve shown that we can out-perform Australia,” captain Joe Root insisted. Australia are beatable. Everyone knows it. The problem, of course, is that saying Australia are beatable is not quite the same thing as saying Australia will be beaten, and an entirely different colour of salmon from actually beating them, which England will now need to do twice to retain the Ashes; three times to win them. Similarly, “Australia have weaknesses” is not quite the same thing as saying Australia are weak. Australia are beatable, but in the same way that the Thames is swimmable: sure you can, honey, but are you actually going to? This is not a distinction, you will notice, that Australia often feel the need to make. The official Cricket Australia social media hashtag for this series is #BeatEngland. Not #BeatableEngland or #PotentiallyExploitEnglandFrailties. Beat England. There it is, in bold unmistakeable letters. And so, we offered Root the chance to make a similar statement to an expectant nation. Talk to us, Joe. Tell us it’s not going to be 5-0 again. So, what was the message to those convinced this tour is heading for a third whitewash in just over a decade? “I’d say I’d strongly disagree,” he replied. Well, at least he disagreed strongly. Personally, I’ve spent the days since the Brisbane Test feeling a touch conflicted about all this. The evidence of the eyes, the evidence of numbers, the evidence of recent history, suggests that these two teams are pretty evenly matched. Even if you account for home advantage, the discrepancy between them on paper is nowhere near as wide as it was between Ricky Ponting and Andrew Flintoff’s teams in 2006-07, or between the two attacks in 2013-14. Australia do look brittle. Cameron Bancroft has now had three failures out of four, Peter Handscomb and Usman Khawaja two out of three. If a bowler goes down injured, who comes in? There are plenty of pressure points there for England to squeeze. And yet. It is easy to say England can win a Test, but far harder to put your finger on how they will actually do it. Adelaide, it was generally held, was their best chance: a pink ball, plenty of lateral movement, even temperate English-style weather. Even then, they couldn’t take 20 wickets. What price them doing so at Perth, Melbourne or Sydney under a baking sun? In short: is it possible to believe fully in England’s ability to win a Test, and yet remain convinced that ability is entirely theoretical? The batting probably deserves its own article. In a country that offers some of the best and truest batting surfaces in the world, England’s efforts so far have been 302, 195, 227 and 233. Yes, Lyon is bowling like Jesus. Yes, the three fast bowlers are sharing the burden to perfection. But equally, England made 551 against McGrath and Warne here in 2006. The quality of Australia’s bowling can only explain so much. England are yet to make a century this series, and three of their top five — Mark Stoneman, James Vince, Dawid Malan — have never even managed one. “They are good enough to make Test hundreds,” Bayliss insisted. Even England’s established players look curiously out of the groove. Joe Root played beautifully on the fourth evening, but he still doesn’t look like making the big hundred that his role and status demand. Moeen Ali has none of the confidence that made him such a dangerous spinner during the summer. Jonny Bairstow’s runs are being wasted at No.7. Alastair Cook will play his 150th Test in Perth, but England’s faith in his powers is beginning to wane. The last time he reached a century against Australia, six years ago, Michael Beer was the bowler. Yet all the indications are that, injuries permitting, England will probably step out at Perth with an unchanged team. A two-day warm-up game will see most of the Test team rested unless they want to play, although Moeen Ali will feature in an attempt to get some miles in his legs. For England, the game is not yet up. Australia still need one win or two draws to regain the Ashes. 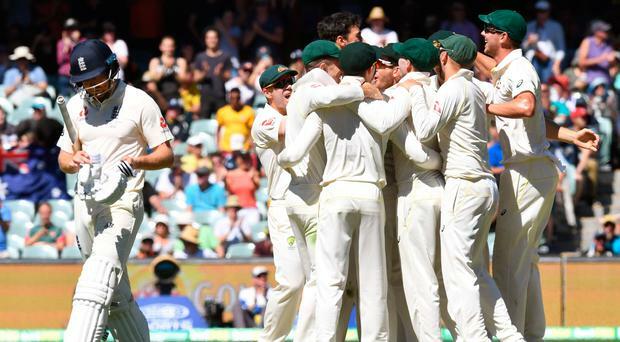 Smith is admired in Australia, but not unimpeachable, certainly as a captain. The press and public are delighted to be 2-0 up, but still not entirely satisfied with the performances. If England can keep the series alive in Perth — starting next Thursday — or even claw one back, there is still the potential for a momentum shift. And last night, Ben Stokes’ path back to the England team was seemingly cleared after he and Alex Hales were provisionally selected for the one-day international series against Australia. The all-rounder is currently playing for Canterbury Kings with he and Hales having not played for England since 24 September after they were declared unavailable for selection until further notice following their night out in Bristol which saw Stokes arrested. Stokes is not currently part of England’s Ashes squad as he awaits the result of the ongoing police investigation into that incident outside a nightclub following his arrest on suspicion of causing actual bodily harm on September 25. Hales was also present on that night out after England’s ODI win the previous day, but will not face any charges.